Discussion in 'Food Plots for Wildlife' started by TimberlandHollow, Jan 29, 2019. Was waiting for the cold and snow to show up for late muzzleloader season. Sadly it didn't show till after season. We get this every 2-4yrs dependent entirely on the weather and the timing of the weather. Hunted my tail off on this little farm. Looked like the numbers were way down this fall, now I'm pretty certain it was just the cool wet weather had them spread out. (Crops still in). The rut seemed nonexistent. Only saw one mature buck all fall. Strange year! Good luck! Hillfarm, Double L, Triple C and 4 others like this. I had a similar thing last year...I had a small soybean plot that the deer visited but not heavily. Then for some reason I put a cam on it after season closed and I had more deer in that plot than I had seen all season long. It's not to the extent that you show (what you show is more deer than my area has in a square mile). But yes...the cold and snow seemed to certainly trigger the accelerated use of the standing soybeans. As much as it frustrated me from a hunting perspective I was glad they had found and was using it and I was supporting them thru the winter. Having this many deer in a plot in my area at one time is unheard of! Mennoniteman and TimberlandHollow like this. Welcome. What part of the country are you from? What he shows is probably more deer than we have in a township! 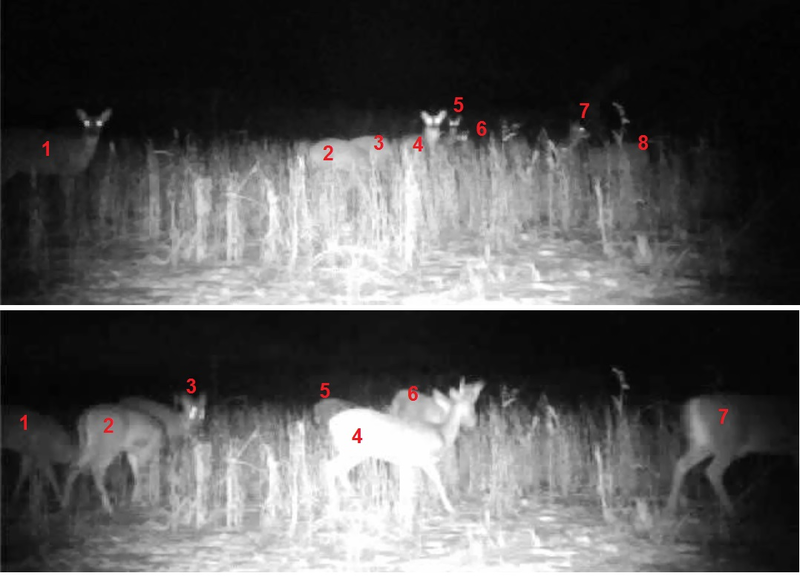 I thought I had seen a bunch of deer feeding together in Central Texas, but that's ridiculous. Late season on the lease I had for 18 years used to find the does and fawns gathered up on a neighbor's place, (thick and nasty), but they would come onto our place an hour or so before dark to feed on the forbs growing in our pasture. We tried to take 20 does a year off that lease in order to keep the density in proportion and most years we had to resort to sitting in the brush and waiting until they came off that place or another to the south of us. At most though, we usually only saw 20/25 does at a time, sometimes less. When the magic time came, it was like watching an African movie when they came pouring over, under, and through the fence. I've never seen so many deer in one field before. Timber, you declare it's not photoshop? In Nebraska, I doubt that. I have seen 135+ in a wheat field at one time in Dawes County on more than one occasion. Not photoshop. I was just thinking how many times over the years I've seen 100 or more deer. I've seen that many in Colorado, Wyoming, NE Iowa, E Iowa and several times in S. Iowa. It happens, rare but it happens. Every time I've witnessed it was with extreme cold and snow. Holy Cow! And I thought I had a bunch of deer. That's a lot of deer burgers. That picture reminds me of the old cartoons where they would have some sort of grazing animal (sheep or cows) and they would all line up and quickly move across a filed like a large lawn mower and eat all the food! Actually stopped counting at 160. Not sure how far they all came from? Hunted the property all fall and my brother and I decided that the population was around half the normal. Then this, we can only conclude that with the cool and very wet weather they were spread out thinner than normal. that's pretty cool - when deer and turkeys do that its like a scorched earth program - wont' be a bean left! Or a low hanging branch. Happens here in Central NY some years - not this year though.